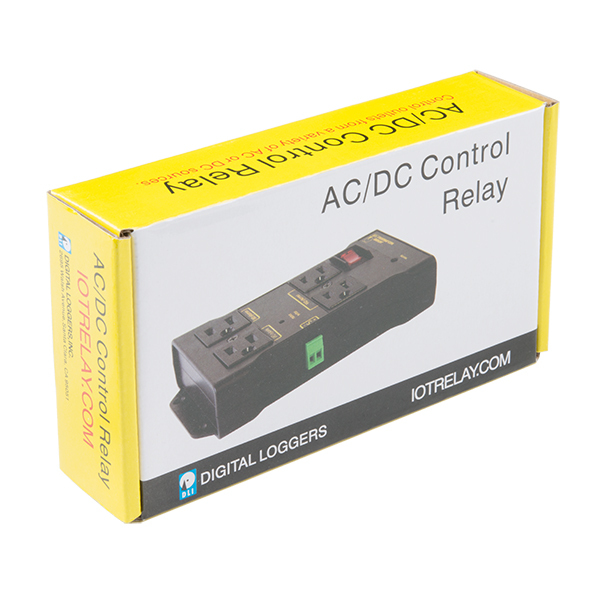 The IoT Power Relay is designed to allow you to safely control an outlet device that operates at 3--48VDC or 12--120VAC. 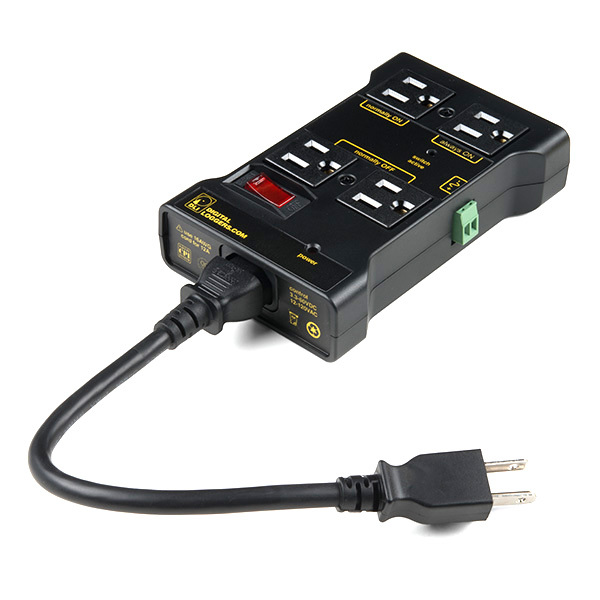 Each IoT Power Relay features a single input (from the included C13 power cable) to four outputs: one normally on, one always on, and two normally off. The durable SPDT control relay is rated at 30/40A, for 400,000 operations. 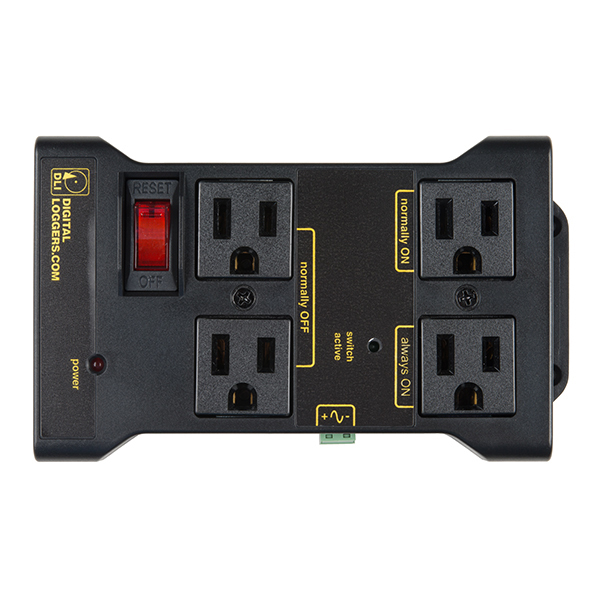 There is an "always ON" outlet that could be used to provide power to your power supply and microcontroller/single board computer if you did not want to connect it to a wall outlet. To connect wires securely to the control pins of the IoT relay, you need to remove the green screw terminal from the socket. Grab the sides of the green screw terminal with your index finger and thumb. Gently wiggle the screw terminal out of the socket. Using a flat head screw driver [ like the SparkFun Mini Screwdriver, the screws can be adjusted to secure the wires in the screw terminals. The screw terminal can be inserted back into the socket when complete. They left out the always off socket! What are the dimensions? Is there a CAD File? We do not have any CAD files, though. Sorry! It's not UL listed, but is well constructed and the circuitry inside is engineered in a safe manner. Check the data sheet for the internal specs. What about agency approvals? UL, CE, TUV? I disagree - this IS for people who "do microcontrollers" as it has no intelligence and just has a low voltage trigger input. It's targeted for people who don't want to do high voltage. I agree with ShapeShifter's comment. I am not an Electrical Engineer nor an Electrical Tech. I don't wire anything that could hurt me or cause a fire (mains level AC) when I mess it up. For my neighbors and me, my connecting a Raspberry PI GPIO (3.3v) and ground pin is a safer alternative to a completely "roll your own" 110v relay solution. YMMV. I currently use a rPI, OctoPI and this to control the power to my 3D printer and an associated light for the status webcam. I need a memory refresh: What's the name of that "green connector"? I know it has a name, and that style is often used with PLCs (Programmable Logic Controllers), but I simply can't recall the name! I believe that is usually called a screw terminal although spring terminals can often look very similar. Can anyone tell me what's different between the original version and the new one? I've got the original controlling power to the router in my CNC and it's been great, don't know what they could have improved. I think one of the Normally On outlets has been replaced with an Always On outlet. This wasn't strictly necessary (you could always just plug something directly into the wall if you want it always powered) but it helps to be able to power an entire project from a single unit, and you can also use the master on/off switch to control everything. i can't figure out what possible use this configuration would be! Any examples? Most people would use the "normally off" sockets to turn something on, but if you wanted to toggle two AC-powered devices so one turns on when the other turns off (and vice-versa), you can do that. Railroad crossing sign? Heating / cooling? I haven't opened one of these things up, but I imagine there's only a single relay inside, which is much simpler than the 4 relays they'd need to control each of the outlets independently. Solid product except for the screws that hold the wires in the green terminal blocks are inaccessible without disassembling the device. Not what I expected, but functionally works just fine. Hard to beat what this does at the price point, but I had to take apart the device and the picture also looks like that is the case. I wanted to let you know that you don't need to disassemble the IOT Relay to use the screw terminals though. The part that you attach your wires to actually unplugs from the rest of the IOT Relay and exposes the screws that tighten down on the wires. Just pop out the green connector, attach your wires and plug it back in and you're in business. Great solution for A/V amp switching. For the money, this is by far the most cost effective solution for turning on an amp from a preamp 12V system turn-on signal. I'll be surprised if I can get 400,000 operations out of it, but at this price, I don't care. I can't build it myself for less. So far it works flawlessly. This is a nice, compact package that lets you turn 120VAC devices on and off with a low power signal. Yes, you could build it yourself, but this is very nice, ready to go, and probably doesn't cost much more than the price of the parts. If needed, you can swap the included power cord (standard computer-type receptacle/plug) for a longer one. There are 2 normally off receptacles, 1 normally on, and 1 always on. 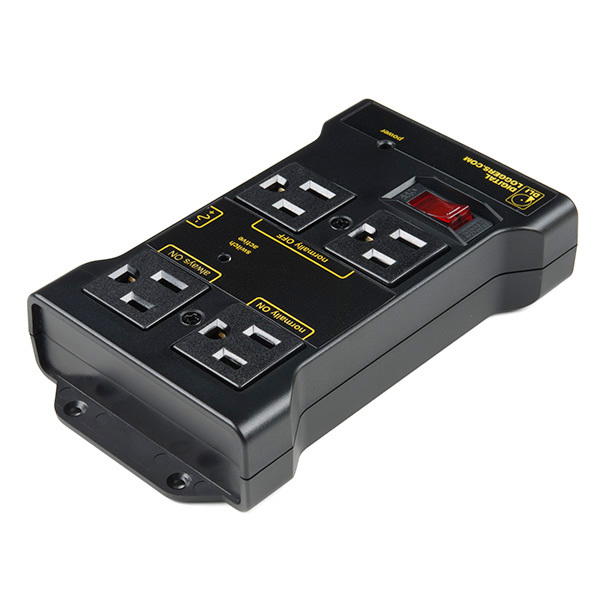 I'm using it with a 5VDC signal, but it can handle a very large range of AC or DC voltage. Definitely way better than making my own. I'll probably buy a couple more of these. I'm using this to control the power to a light and 3D printer from a Raspberry PI running OctoPI and the standard PSU Control plugin. The PI is always on and one GPIO is used to switch the relay. I feel much more comfortable doing simple wiring at 3.3v DC vs 110v AC. The only thing I MIGHT change would be to allow (via switch or jumper) each outlet to be defined as always on, normally on or normally off. At first it was kind of unorthodox for me to use but it is really neat and handy. Works perfectly with 3.3 or 5 VDC input. In our test, we alarmed our neighbors by flashing S-O-S repeatedly.. Our real application is to use the relay to simulate our normal lighting patterns when we are away. You can power your project with the always on and control the switched one with a pin. My son's first project was to use it with the IR Thermometer Evaluation Board - MLX90614 to build a thermostat for my sons fan. Works great! This is a very simple to use device and it has many uses.